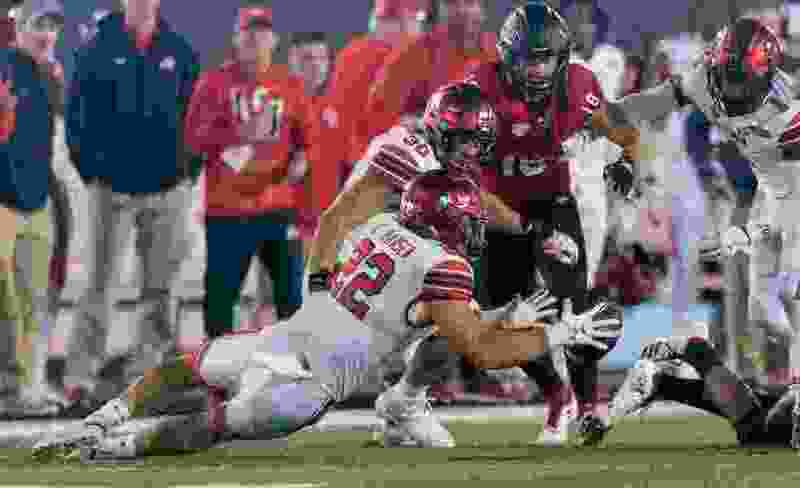 DeKalb, Ill. • In Utah’s eighth quarter of the football season, the Ute defense finally recorded a takeaway when safety Corrion Ballard stripped the ball from a Northern Illinois receiver and linebacker Chase Hansen recovered the fumble. The Ute offense promptly wasted that turnover by giving the ball right back to the Huskies on running back Zach Moss’ fumble. Hansen personally made sure the Utes would capitalize NIU’s next turnover. Hansen’s interception stopped what could have become the Huskies’ winning drive, and that’s not all. His 40-yard dash to the end zone clinched Utah’s 17-6 victory Saturday night at Huskie Stadium. Ute coach Kyle Whittingham labeled it a “checkmate play,” and it stemmed from Hansen’s studying NIU’s offense like a chess player. Utah was in man-to-man coverage, and fellow linebacker Cody Barton took the running back coming into the pass pattern. That enabled Hansen to roam like a safety, his former position, and he recognized a route that usually came from a formation with three receivers to one side. So he jumped into the passing lane and made a game-saving play. Even if the Utes merely would have held on for a 10-6 win, Hansen and the rest of the defense would have been credited with an outstanding performance. The touchdown just made it that much better. Utah’s offense provided only 10 points. Utah’s defense got a break that helped that group hold NIU to six points, as the Huskies’ first-and-goal opportunity in the second quarter resulted in a botched field goal attempt. But the Utes limited NIU to 228 total yards, and repeatedly came through in the second half. The Huskies converted 5 of their first 8 third-down plays, although they finished 7 of 20. Whittingham was disappointed that NIU rushed for 125 yards in the first half (before the 23-yard loss from the errant snap was subtracted), but the Utes got tough after that. Barton was credited with 13 total tackles and cornerback Jaylon Johnson added eight stops; each made a tackle for loss. Barton’s only glaring mistake was a penalty for a late hit out of bounds, leading to NIU’s second field goal. Utah’s defense has not allowed a 20-yard play in two games, and Weber State and NIU have passed for a total of 124 yards. An interception was the only thing missing from the defense’s credentials, and Hansen checked that box emphatically. • Two sacks for a total of 24 yards.